Looking for a great way to showcase your local market while simultaneously driving traffic to your real estate website? Neighborhood profile pages are the Ace up your sleeve. Neighborhood profile pages are an excellent lead generator that will build your credibility and reveal you as a market leader who truly knows the area. Stocked with pertinent information, these pages educate buyers and website visitors. The result is an increase in target website traffic and an SEO boost for targeted areas. (View our Neighborhood Profile Add-on built for WordPress). Neighborhood profile pages are a cache of real estate specific information to enhance your site overall. And, after all is said and done, the ultimate goal is that the client is connected with you! Compile a list of communities, starting with the most important. Tackle the first three to six and post them on your site as soon as possible. Add a new profile every two weeks, giving the search engines new content to index. Concentrate on popular neighborhoods that have a lot of real estate activity. Keep in mind that your competitors will be focusing on the same neighborhoods, so make yours stand out with more valuable information and insight. It will be worth the extra time. SEO web crawlers are always on the prowl for popular keyword phrases. Get your neighborhood profiles to the top of search results by utilizing key words and phrases that online visitors will use to find homes for sale. For example, a neighborhood profile featuring Roseville would interweave a few of the following phrases into the content: Roseville Homes for Sale, Roseville Real Estate, Homes for Sale in Roseville, Roseville Luxury Homes, Roseville Estates, Roseville Horse Property, etc. Try to stick to two or three key word phrases, using them in the title, body copy, description and meta tags. Keep it natural and avoid overloading the profile with too many key words or the search engines will have difficulty figuring out what the page is really about. “Many people also consider Granite Bay homes for sale since the community boarders Roseville on the east.” (Hyperlink Granite Bay homes for sale to your Granite Bay neighborhood profile page) Check out our two blog posts Link Building 101 – A How To Guide and Resources to Link Building Tips and SEO Best Practices for more ideas. Overall Profile – Cover the neighborhood and what makes the area appealing, including schools, parks, affordability, views, peaceful atmosphere, small community, history, culture, University, etc. Demographics – Look to your local government office for unemployment figures, population, the seasonal climate and so on, or better yet, look for websites online that offer demographic information. Market Statistics – These can be presented as a brief paragraph summary, a link to a PDF document, or a visual graph. Better yet, try Marketboost which offers detailed, up-to-date market reports and the ability to email updated reports to your clients directly. A great drip marketing tool! View MarketBoost in action. Testimonials – Ask the people who live in the area what they love about it! Add a photo to give it a personal touch. These bullet points can each be used as an individual paragraph, helping to form the framework of your profile and giving it a sense of focus and continuity. Do your best and remember that you can always come back and beef up the information at a later date. We advise that you review the neighborhood profiles at least once a year to update stats, add new insights and freshen up the content. If you don’t already have pages for the preceding bullet points, create them! Check out 10 Tips to Writing a Successful Real Estate Blog Post for ideas for your own blog. You can also brainstorm a list of questions that you are repeatedly asked about your local area and be sure to answer them in your neighborhood profiles. It is worth your time to use stunning photos on your neighborhood profile pages. Build a nice gallery of images for each neighborhood by including local parks, shopping centers, entrance signs, historic buildings, museums, the University, biking and walking paths, trees, rivers, and lakes. Also use images of people engaging in popular activities to give visitor’s a visual of what they could potentially do. If you have the funds, hire a reasonable photographer to spend the day taking pictures for you and see if you can negotiate a flat rate for all their photos. If you live in a popular area you might find stock photography you can purchase at a good price, which saves you time while you get professional images. We offer an extensive list of High Quality and Free Stock Photography that might get you jumpstarted. If your budget is tight, take your own photos using a good camera, just be sure to take several photos of the same subject so you have a few to choose from. Get creative and see what you come up with. Videos are another engaging tool (Read our post on The Power of Marketing with Real Estate Video). You can create short videos of each community or one video that covers several areas. Nowadays it is easier than ever to find video production talent that can create short videos with voiceover or music. The production prices are lower than you might expect and the benefits of using a video can go a long way. If you want to do it on your own and keep it simple we suggest Animoto – Real Estate Video Marketing, which allows the user to create a slideshow of photos and short movie clips put to music. People want to see listings, so give them what they want! Many IDX solutions offer the ability to display listings in a specific area or community right on your neighborhood profile pages. This visual candy will entice visitors to stay on your site and look around at other neighborhoods. IDX featured listing widgets are dynamically updated so you do not have to do any of the leg work. Sign up for New Listing Notifications (provide a simple link to your IDX sign-up form). Offer a relocation guide or ebook download. Branded material that will keep your name in front of them. End with a contact form (set an appointment to take a tour or ask a question). Ending each profile with a call to action is an easy way to wrap up a solid neighborhood profile. See what your competitors are writing to get ideas (but don’t plagiarize!). Check your local board for stats, demographics, maps, graphs, etc. Wikipedia is a good source for historical info, demographics and subjects you might never have known. Local city and state park websites offer recreational ideas, trails, and maps. Browse your state’s official tourism website for information on popular attractions, maps and possible media photo gallery you can get permission to use. Local Chambers offer business lists. Online website resources such as NeighborhoodScout and Onboard Informatics offer data you can work with or the option to license their data. If you still need additional content, try online restaurant and business reviews, such as Restaurant.com or Yelp. Your local government office will give you unemployment figures, population, seasonal climate, and so on. Leonardi Real Estate offers informative insight, notable links, area photos, current listings and call to action to contact them. Luxury Specialist Greg Boyle elegantly combines informative descriptions, keyword links, MarketBoost market information, great photography and current listings. Nicole Truszkowski’s neighborhood profiles offer in depth information with comments about the area real estate, market reports, lifestyle videos, current listings link, area map and more. The Souers Teams combines great description, photography and market reports as well as current listings for sale. As you write your neighborhood profiles, you will discover that some neighborhoods will have a wealth of information, while others will be sparse. When this happens, just hunt around on the Internet and you will be surprised at what you might find. Happy writing! More than ever a real estate website is recognized by agents and brokers as an invaluable tool to generate leads and connect with clients. For over 20 years IDXCentral.com has been specializing in real estate website design, IDX sales and integration. We would love to show you what we can do. 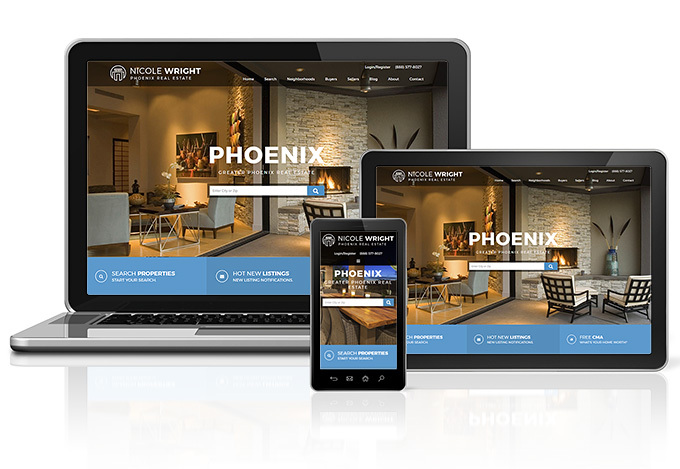 Learn more about our real estate website services or contact us now.